The latest iPhone cameras are able to record ultra high resolution video at 4K resolution, though the high definition movie capturing ability is not enabled by default. 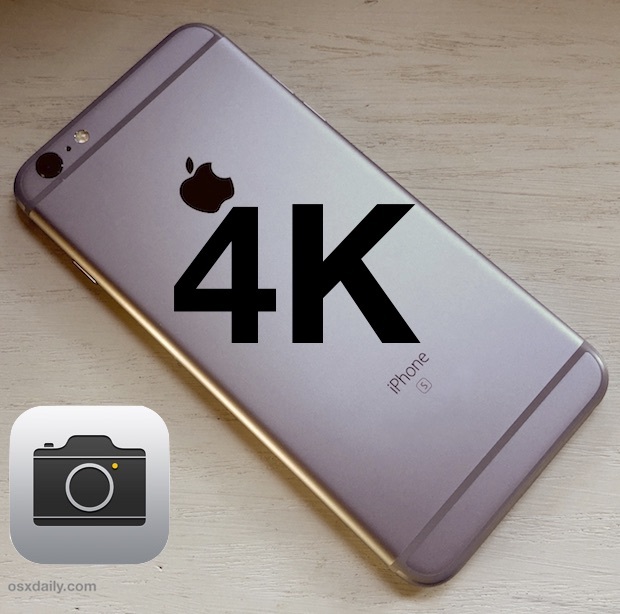 Thus, in order to capture 4K high definition video with the iPhone you’ll need to enable the super HD recording feature first, which is done through the devices camera settings. 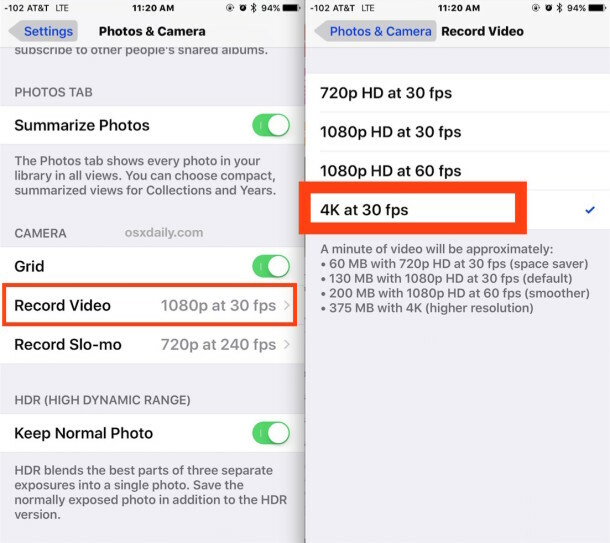 If you were wondering, the reason the iPhone 4K video recording feature is turned off by default is likely because of the significant storage requirements that are necessary to capture and record 4K video. Thus, the iPhone video capture default is set to 1080p at 30 FPS. More on the storage requirements in a moment, but first let’s show how to enable the 4K video recording for those who want to capture truly HD video with their devices camera. Now that 4K video recording is enabled, you’re ready to go. While you’re in these settings you may want to go about changing the slow motion recording speed as well. Once 4K video capturing is enabled, any video recorded with the default iPhone Camera app will capture at the ultra high resolution 4K. 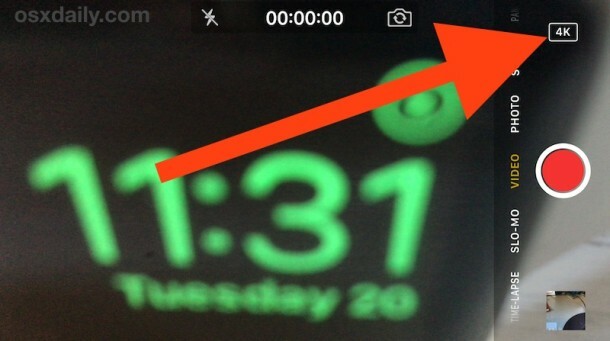 This is indicated clearly when in the Camera app Video mode by the “4K” badge” in the corner of the screen both before recording and while capturing video. Video captured in 4K is incredibly smooth and arrives at such a high resolution that most TV sets can’t even display the full quality. As with other capture modes, you can continue to snap a still photos with the normal camera while recording 4K video. So why not always use 4K video all the time? The settings app hints at this while you’re making the adjustment from SD to HD to 4K video. As you can see, the 4K video capture takes up nearly 3x the storage space as the default recording option, and a whopping six times the storage of the lower resolution 720p. This is important to keep in mind, recording 4K video resolution takes up a huge amount of storage space, so you’ll likely want to transfer the ultra high resolution videos onto a computer rather quickly instead of letting them linger on the iPhone and take up precious storage. You’ll also want to be sure plenty of free space is available while recording the 4K video, otherwise you’ll quickly run out, which stops the video capture whether you’re ready to stop recording or not. For those without the latest iPhone models (6S and 6S Plus), you can still make adjustments to the quality of video recorded on the device, primarily by setting the video to record at 60FPS while in 1080p, which is very smooth and looks great too. Given that most televisions and monitors are 1080p or less resolution, the video still looks phenomenal, but clearly the near future of video is at the 4k resolution. That’s why i love so much Iphone , i also have Iphone 6s and the quality of the camera it’s awesome . Actually, I am sorry but, I could not understand your purpose. If you want to record with your phone, record it. What is the need of bluetooth ? Can you explain me slowly, slowly. Ok so I need help! I went to my camera settings and did the 4k but when I upload a video into Facebook for example it still looks kind of blurry…why is this happening! ?